Lupus, an autoimmune disease, is very difficult to diagnose. Because lupus rarely presents itself the same way in any two people, it is very challenging for those in the medical profession to understand, diagnose and properly treat the disease. Often a diagnosis can be long coming, which can be extremely frustrating for both the patient and physician alike. 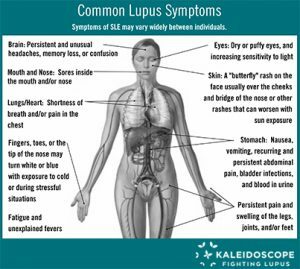 The fact that the symptoms lupus presents may have sudden onset or progress slowly and could be temporary or permanent, making diagnosing lupus confusing and concerning. Symptoms of lupus in men may also vary from those in women. There are, however, certain common signs and symptoms that may cause you to ask, “Could I have lupus?”. 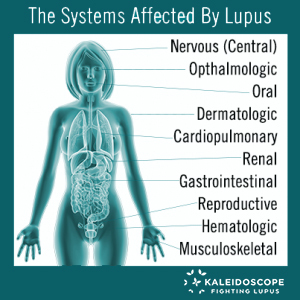 Lupus often affects many different systems in the body, and therefore, if you do have lupus, the symptoms you may experience will depend heavily on which part of the body is being affected by the disease. Brain and Nervous System: persistent and unusual headaches, memory loss, or confusion (brain fog). Lungs: lupus can damage the lungs through pleurisy and pneumonitis (inflammation), or pulmonary emboli, resulting in shortness of breath and pain in the chest from deep breathing. Renal System: About half of systemic lupus erythematosus (SLE) patients will develop some form of kidney inflammation, called lupus nephritis. This inflammation can lead to kidney failure, but like most lupus symptoms the effect on the kidneys is quite variable and hard to predict. Increased protein (showing as blood) in the urine, swelling of the feet and legs, and high blood pressure can be indicators that the kidneys may be affected. Eyes: damage to nerves and blood vessels in the eye might be evident, leading to dry or puffy eyes, and increasing sensitivity to light. Mouth: sores inside the mouth are a common symptom of lupus. Skin: lupus is known for producing a distinctive “butterfly” rash on the face, usually over the cheeks and bridge of the nose. These rashes can be exacerbated by sun exposure (photo-sensitivity). Hives or sores may be present, which worsen with sun exposure, and sudden and unexplained hair loss could also signify lupus. There are several types of skin lupus, called cutaneous lupus. Learn more about them here. Fingers, Toes, Tip of the Nose: fingers may turn white or blue with exposure to cold or during stressful situations, caused by the constriction of small blood vessels in those areas. Called Raynaud’s phenomenon, this condition is closely associated with lupus. Stomach & Digestion: lupus can cause or exacerbate ulcerative colitis, pancreatitis, and liver conditions, resulting in nausea, vomiting, recurring and persistent abdominal pain, bladder infections, and blood in urine. Legs, Joints, and Feet: persistent joint pain and swelling is a common lupus symptom; legs and feet may also swell. Rheumatoid arthritis is a common overlap disease with lupus. If you develop an unexplained rash, are having ongoing fever along with persistent aching or fatigue, write these, and any other accompanying symptoms down and seek a medical professional such as a rheumatologist. Our blog page has over 100 blogs on various lupus topics, please check it out to find more information specific to your needs. For more information on lupus symptoms and other lupus related topics click below.